I received a lot of comments asking for an explanation of how I made the model and more specifically the curved geometry. Sketchup by itself is not well suited for “organic” modeling. You need the right plugins to get the “rhino-esk” functionality. What I have done in this model is not considered complex however anything more intricate probably should not be modeled in Sketchup. Software like Rhino is better suited simply because these programs use NURBS based modeling instead of mesh which allows for more editability and handeling of complex geometry. In the case of my model below, I can start to bridge the gap between Sketchup and programs like Rhino by using free plugins. Before I get into what plugins I used, I wanted to talk about the process. One of my biggest pet peeves is when people design based on the limitations of software. I’ll admit that I prefer to model in Sketchup. However, I am not going to change my design based on what I know I can model in Sketchup. Before I started modeling, I evaluated my design based on sketches and massing. I came to the conclusion that I could accomplish what I wanted in Sketchup without going into Rhino. The two programs work well with one another so it would not have been a daunting task to model back and forth between the two. At the same time, I like the simplicity of working in one software vs. going back and forth between multiple programs. In Sketchup, curves take a little longer to model and therefore it is tougher to test out many iterations and ideas. Instead, I worked out details and form through sketching and massing. Above, I’ve shown some of the sketches produced when designing the new form. Each sketch is looking at a particular situation and making tweaks on the form. Something that takes seconds to sketch could take hours to model. Below is one of the massing models used to explore basic forms and ideas. I used a plan and section which gave me basic volume information from which I could develop my massing. You may notice that there are certain elements that can be seen in the final model, but nothing is fully resolved. I was focusing on where and how the building cast shadows, how to form the land around the building, and how the form would reinforce my concept and performance, among other things. Once I had a good base going, I began modeling the curves and softening the transitions. I have tested out many plugins and the problem I come across with most of them is how unstable they are. If they were not used just right or used inside of a group, they would crash my model. The series of plugins that I have found to work best are the FREDO Tools and more specifically the Curviloft plugin. You need to install 2 ruby scripts, the LibFredo6 found here, and the Curviloft found here. You will also need to log into Sketchucation (Free) to download the plugins. For this model, I really only used the “loft by spline”, however I have often used the “loft along path” and “skinning” in past models. I started the process by (1) taking line work off of my base massing model, (2) using the Arc tool to soften the corners, (3) leaving me with smooth line work to loft. Once I had a series of lines ready to loft, I started the Curviloft plugin. The process is really straight forward. (4) I choose the first spline curve, (5) then I choose the second spline curve, (6) and then hit the check mark twice to complete the process. The plugin creates a smooth surface between the two spline curves, allowing you to choose how many times to subdivide the surface among other options. The best part is that the plugin is really stable and can be used inside of groups. I only used 2 splines for most of the lofting, however, as you add more splines to a single loft, it allows for even more complex geometry, and the plugin handles it with ease. Finally, time was spent cleaning up the edges removing any unnecessary line work. This meant hiding a lot of the line work. Below, I am showing two screen shots. One with the hidden geometry on, and the other with it off. This tells a better story of what is going on with the geometry and how well a model can be cleaned up for presentation purposes. If you have ever used Rhino, 3DS, Maya, etc, you know that lofting is one of the most basic tools. However, it is an essential tool that is lacking in Sketchup without the plugins. I’m curious what your thoughts are on these plugins and if you have suggestions for other plugins to try. There are obviously a ton out there, so let me know which ones you use the most. how do you give a thickness to lofted planes? you just need copy the exact surface above or below and cover the gap between those faces, i know it’s messy and need a lot of careful rework to be done for clean edges. but it’s sketchup guys it’s all about adjustment.hope developers understands these problem for complex model and give us spline modelling options in upcoming version or some adjustment in it’s native state modelling. use joint push pull tool! great work, but still prefer your simple project, there's more passion in them. the memorial visitor center is a great work! Looking at your portfolio I understand that you know how to use Grasshopper, would you mind making tutorials for that or some guidance on where to start. I used Grasshopper a few years back for my thesis, however I haven't used it in a while. I prefer to keep this website specialized in architectural graphics (even though I occasionally do a post on Sketchup). Besides, there are already a lot of great sites that are creating quality tutorials on Grasshopper. Extrude Tools by TIG is a good alternate to Curviloft. 1. My linework that I export out of sketchup is always jagged and not clean like yours looks. reading that photoshop gives you, do you change it to a higher dpi or leave it? I appreciate your work, thanks for the tutorials. Your work is so great! I can't love it more! Don't use SketchUp. I repeat, do NOT use SketchUp. If you're gonna learn how to do something, learn how to do it the right way! Good luck finding a top notch arch office using SketchUp. Oh, and look at Luxigon's modus operandi and what they have to say about SketchUp. No Curvioft available for it apparently. Specifically, there is no longer a plugin folder availbale to instal LibFredo library and tools. ANy suggestions on how to get curviloft again for the upgrade? Downloaded the sketchucation plugin store and found LibFredo plugins there. Im curious to see if you have ever done such a design in Revit. I work for DP Architects, the 7th largest firm in the world. They use Sketchup. I was talking about quality (not corporate) architects. Please get off of your high horse! As a user of both Rhino and SketchUp, I prefer SketchUp for it's speed and ease of use in conceptual work. Also, have you even looked at the top notch work Alex creates? Currently, I see SketchUp as much more an industry standard than Rhino. No matter how well you know Rhino, not everyone is going to be able to vie for a position in OMA, H&dM, MVRDV, SANAA, Steven Holl and so on…(sic). Most of us are interested in making a living – not being one of the chosen few to work for starchitects. I think it is incredibly arrogant to denounce 'corporate' architecture in the way you do. Get a life man. It's not Starchitects vs Corporate Architects. It's great software (Rhino) vs mediocre software (SketchUP). And I'm sorry to inform you (if this is news to you) that at a professional level SketchUp is nothing but mediocre. If you feel that strong about SketchUP vs. Rhino you should just start a blog that is devoted to Rhino. This blog has been great for me and any others who all have jobs at architecture firms and students alike. Wow! This program looks to be absolutely awesome.It looks like it's really easy to use. After reading this post I think that I will give it a try. I think sketch up has its uses, while i personally haven't used Rhino it seems it has its own place as well. They way i see it and correct me if im wrong. It seems like Sketch up is the preferred software for students to use in school. While The use of software such as Rhino or Revit is more of the professional side. The way ive done it is. Ill use sketch up for very free form shapes such as what Alex did. I attempted doing something very similar to this in Revit, and it was a hassle, and didnt come close to looking like what was created in Sketch up. I will use Revit though since i feel its more of a industry standard just how Rhino is. Maybe im wrong and there is such a need for Sketch up. I think overall we should respect each others use of software and appreciate for the exchange of informaton. The work Alex has been showing is really interesting and great learning. I personally don't mind him using Sketch up. So lets just set aside differences and enjoy the lessons. Dp Architects are based in Singapore which may be why you have not heard of us. It is not uncommon for narrow minded people to be xenophobic. Both Sketchup and Rhino (and Revit and 3DS) are used within the company, each for different purposes and stages of the process. I was making the point that sketchup is used in many firms, although you are correct in saying it is unlikely to be the sole piece of software used due to its limitations. It is useful to be proficient with many different software products to ensure you don't limit you're own options and design capabilities. I completely agree. Also on the point of it being used by students, this is one of the reasons why Alex's blog is so impressive. He focuses as much as possible on free software and doesn't charge for the tutorials, making it universally accesible. As an architect this is very important to me. I don't feel strongly about anything. I just said that SketchUp is borderline mediocre, so talking about lofting and those kind of operations is pure nonsense. It's preferred by students because it's the easiest one to learn. xenophobic? 'cause I've never heard of your wonderful office? Dude, grow up! come on…… i'm sure Alex has never sent an invitation card for you to come and visit his blog, niether has he rolled out the red carpet for you… if you think he's talking nonesens then stop visiting this blog, also put an end to arguing with everyone and wasting everybody's time. Hope you'll stop acting like a kid soon. Hi Alex, which FredoTools plugin do you use to soften the corner? I would echo people's take on your opinion. Interestingly enough though, I was having a similar discussion with some colleagues recently and several of these points came up. However, what strikes me as odd is that you are not critiquing Alex's work, aesthetic, or composition? You're actually critiquing Sketchup which is just a tool. If the tutorial instead showed how to use pencils or watercolor, would you still hold the same reservations because of how 'mediocre' that methodology is in the digital age? You can loft surfaces using Revit, Sketchup+Plugins, AutoCAD3D, Rhino, Rhino+Grasshopper, etc. There is no golden rule, and if you prefer a different method, fantastic. Grow up man, every person has the right to chose their own software and perfect their skills with it, anyways, "program skills" aren't what defines us as architects, its our ideas that define the work we do, software doesn't have to become that tool that makes or breaks our designs. 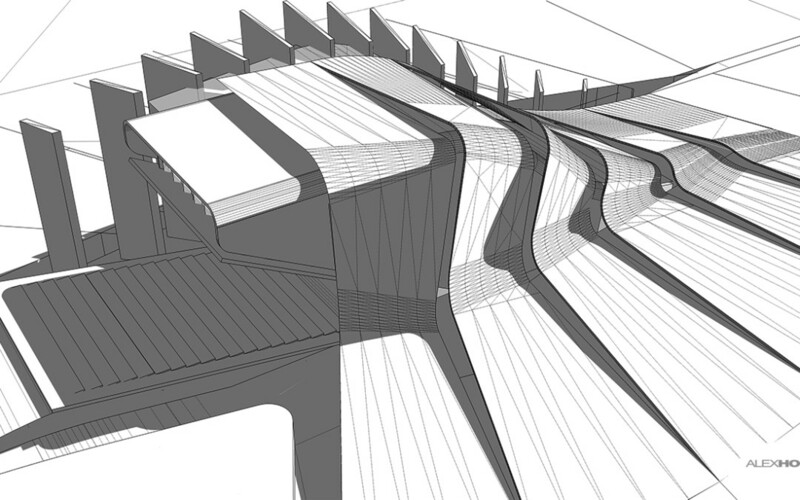 FYI, check Peter Guthrie's page if you want more proof of what can be achieved with sketchup. @Alex, Thanks for creating such a great blog, I think everyone learns a lot about the presentation techniques you use. First, great work, Alex! Second, after reading through the comments, I have to stand with Jay. Not one person managed to address the issue he raised, rather he was basically told to leave. Talk about childish behaviour. The mature thing would’ve been to explain what is so special about Sketchup, as I’ve found it to be an extremely limited tool, which isn’t even that good at the few things it can do. Hey alex, these plugins you use in here are available for mac?